The last two weeks I had the chance to play around with Google Wave. Since Google Wave was announced I was very curious. Wave seemed to be the next big step for an integrated communication application. When I first looked at IBMs Activity Explorer more than 3 years ago I was very enthusiastic about the new approach of communication and collaboration. 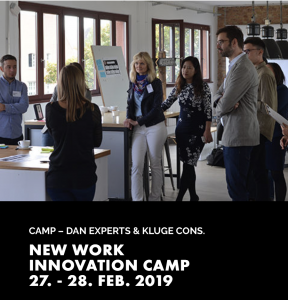 Very good idea to have synchronous and asynchronous communication in one place, add documents and notes and work with others on presentations and project plans. But when I started to work with Activity Explorer I realized it is not easy to cope with this new kind of integrated desktop. It was a lot of information in one place at the same time. And as IBM released it, it was slow and more a kind of prototype for building the Eclipse based Notes 8 client. Unfortunatly the degree of integration of chat, email, documents, etc. in Notes 8 is still not what I expected after working with the prototype years ago. Still you live in your inbox, Activity Explorer and Sametime live somewhere in the sidebar. Yes, I know, there are lots of context right mouse click menus, there is persistent chats and much more – but still things feel not as integrated as I expected it to be. Now, with Google Wave, you have everything in one place. And you have it real-time. No matter if you are in a chat, work on a document or hold a meeting – everything what you do is real-time. Your co-workers see what you are doing right now in that specific document (you can turn it off if you want). You can take synchronous chats offline, switch to e-mail in asynchronous mode, re-open the chat again, add other co-workers and so on. Another new way of working with documents is the possibility to reply anywhere in that document. You can start conversation like it would be a comment right at a specific point in the text. Makes it much easier do start conversations about a document or email without the endless “reply-to-all-with-history” threads. With those features Google Wave for me is the first tool I worked with which really integrates synchronous and asynchronous communication. 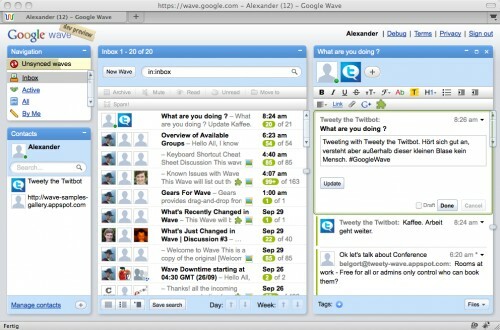 And there is a lot more in Google Wave. It is very simple to ad Gadgets or Robots to your Wave desktop and share stuff with your co-workers. I am not a programmer, so I am not the one who tests the API and writes code. But from what I can see there is a huge potential that Google Wave becomes a platform for collaborative applications on top of that new concept. Finally I have to admit that I needed my time to get the message. 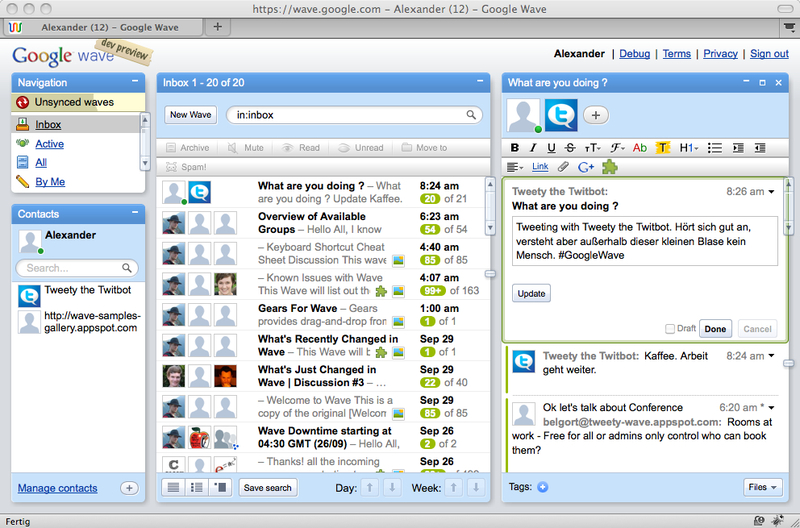 First look at Google Wave caused confusion, and because it is Beta, it caused some crashes too. Safari did not really want to work with Wave, but Firefox did well. Sometimes using Google Wave slowed down my MacBook too much I had to close the browser app. And I really would like to test that stuff not in the closed sandbox environment. Lets see when they put it out in the wild. I am very impressed, and looking at the collaborative solutions outside that I have seen and worked with the last 15 years, my guess is Google Wave will set new standards.